What's Driving the High-Rise Construction Boom in Chicago? The website Chicago Tonight is reporting that Chicago is seeing a rise in high-rise construction with 34 new buildings over 200 feet tall currently under construction. The website Chicago Tonight is reporting that Chicago is seeing a rise in high-rise construction with 34 new buildings over 200 feet tall currently under construction. That number has doubled in the last 15 months. What's causing the sky-high building boom? Curbed Chicago editor AJ LaTrace joins "Chicago Tonight" to explain. "What we're seeing right now is a huge resurgence in rental and in hotels," LaTrace said. "Largely to do with the influx of young workers in the tech industry. But there's also a lot of empty-nesters moving back to the city who would prefer to rent." LaTrace said developers are feeling confident in the rental market right now. “These 34 buildings that we tracked, we're seeing about 7,000 apartments just in these buildings, and that doesn't even include stuff that's coming up throughout the neighborhoods,” LaTrace said. There's a reason developers are building more rental units. It's not just what's inside the building that's changing. Many of the new high-rises have a similar look to one another. 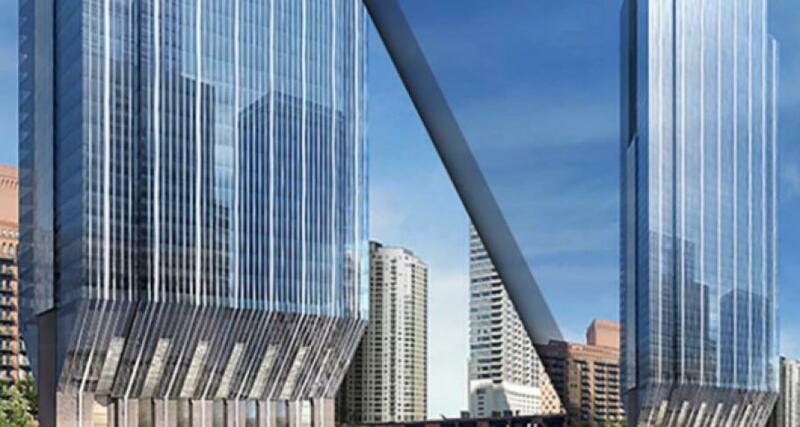 One tower – the Wanda Vista tower – could be the third tallest building in Chicago if constructed.